The Sony RX10 II is a high-end bridge camera that uses a larger than normal 1-inch sensor to achieve superior image quality. 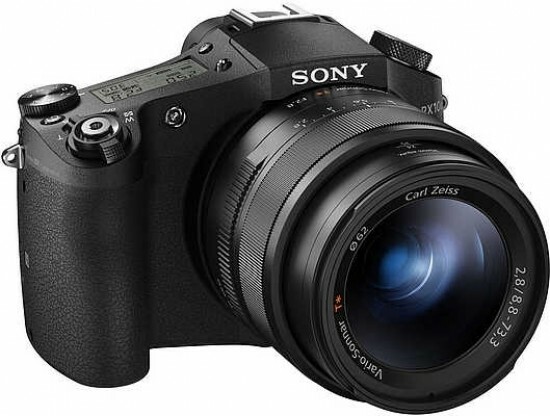 The sensor itself is an upgrade over that in the original RX10, as despite being the same physical size and 20.2MP resolution, its new Exmor RS design features a stacked layout with enhanced signal processing for a claimed 5x faster image processing speed. This translates to a 16fps burst shooting speed (up from 10fps in the RX10), and 4K (3840 x 2160) video recording is now possible, along with a new a High Frame Rate, super slow motion shooting mode that captures shots at up to 1000fps. Other fresh features include a blistering 1/32000s maximum shutter speed which enables you to shoot in direct sunlight whilst also exploiting the lens’ f/2.8 maximum aperture for reduced depth of field effects. The shutter also boasts an anti-distortion capability, which combined with the boosted image processing speed, should minimise distortion when capturing very fast-moving subjects. 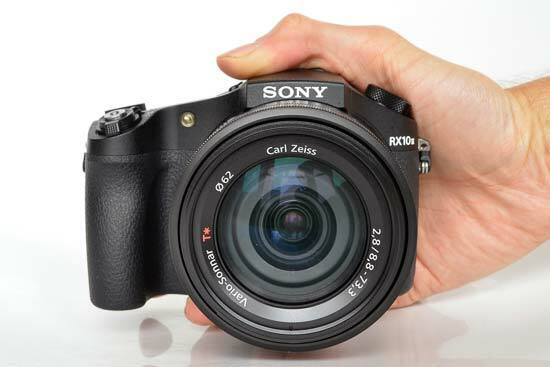 Like the original RX10, the new model uses a fixed lens with an 8.3x optical zoom range and a constant f/2.8 aperture. Wi-Fi connectivity with NFC pairing is also carried over, but the camera’s electronic viewfinder has been upgraded to a 2.35-million-dot device. The main monitor is still tiltable, but not touch-sensitive. Top-notch build quality rounds off the RX10 II, but it also helps increase the price, which is now around £1200/$1300, making this one of the most expensive bridge cameras on the market. 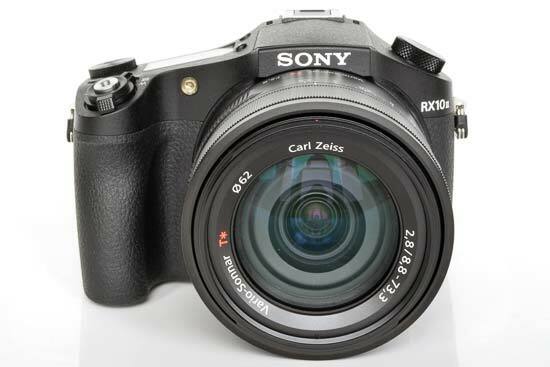 Externally there’s little to tell the RX10 II apart from the original RX10. Both cameras share the same 129mm x 88.1mm x 102.2mm dimensions and 813g ready-to-shoot weight. This means the RX10 II is roughly the same size as an entry-level DSLR with a small prime lens attached, and it’s actually a little heavier. That’s because, just like a professional DSLR, the RX10 II is built around a tough magnesium-alloy chassis that’s dust and moisture resistant. There are also other features traditionally reserved for DSLRs, like a top panel backlit LCD that clearly and consistently displays current shooting settings. Next to this there’s a hotshoe mount for a flashgun or accessory, and even the shutter release button is designed to accept a traditional screw-in remote release cable. The last time I came across such a feature was on a Nikon F80 film camera, circa 2000. Encircling the shutter release is the power lever and also the zoom rocker which can zoom the 8.3x zoom lens slowly or quickly, depending how far you turn it. The lens can also be zoomed using a DSLR-like zoom ring around the lens barrel, and though this is just another way to actuate the lens’ motorized zoom rather than being a direct mechanical control, it works precisely and with barely any lag. Behind the lens barrel zoom ring is an aperture ring, which has an accompanying switch on the bottom of the lens so you can choose whether the ring clicks into each aperture or rotates smoothly. There’s no automatic setting on the aperture ring, as the camera automatically takes control of aperture when you’re not in aperture priority or manual modes. The lens itself may only offer 8.3x 24-200mm-equivalent optical zoom range, but it does boast a constant f/2.8 aperture, and combined with the larger than average sensor (for a bridge camera), means you can capture shots with a fairly shallow depth of field to isolate your subject. A pair of dials are mounted to the top of the RX10 II. On the right, within easy thumb reach, is an exposure compensation dial with +/- 3 stops of adjustment. Although the dial is located right on the corner of the camera, it’s stiff enough to prevent accidental rotation. Next to your left hand there’s a mode dial with the usual scene-detecting fully automatic mode, a programmable auto mode, aperture and shutter priority positions, and a fully manual setting. There’s also an ‘MR’ (memory recall) mode, where you can quickly access a previously-saved shooting set-up. Next up on the mode dial is a dedicated video mode. The RX10 II is now capable of internal 4K 3840 x 2160 recording at up to 30fps for 29-minute durations, plus you can also capture 17MP stills whilst recording. 4K videos are captured in the new XAVC S recording format which provides up to a 100Mb/s data rate, and all without resorting to pixel-binning, with the result being maximised clarity with reduced jagged edges and moiré patterns. The next mode dial setting is the High Frame Rate mode where the RX10 II is able to capture super-slow motion video clips. Up to 1000fps is possible for 40x slower recording, though at a reduced resolution of 1136x384, and for only two seconds. However, that does equate to 1 minute 20 seconds of playback duration when viewing at standard PAL 25fps. Additional recording speed settings of 500fps and 250fps are available at resolutions of 1676x566 and 1824x1026 respectively. You can also shoot at the same three speed settings for four seconds instead of two, but with an approximate 30% drop in video frame resolution. It’s all great in theory, but you’d better have the right type of SD card to record 4K video or use the High Frame Rate mode, as otherwise the RX10 II will disable these features. You’ll need to specifically use an SDXC Class 10 or UHS-I compatible memory card, as even a 95MB/s Sandisk Extreme Pro Class 10 card was rejected purely for being an SDHC card and not SDXC (it functioned perfectly well for shooting stills and HD 1080p video). Reformatting the card to the exFat file system was no help either, despite this effectively converting it to SDXC specification. The only solution was to use an authentic SDXC card, which was accepted by the camera, despite it actually being slightly slower than the SDHC Sandisk card. Hopefully a firmware update will relax these strict requirements, as ultimately it should be up to the user – not the camera – to decide whether a memory card has the necessary speed and formatting to handle high data rate recording. The final two mode dial options include Sony’s Sweep Panorama mode, and a Scene setting containing various scene presets you can draw upon should the scene-detecting Intelligent Auto or Superior Auto modes not deliver. These modes are usually given dedicated mode dial positions on Sony’s compact cameras, but you’ll need to press the ‘Fn’ button on the RX10 II’s rear panel to display the camera’s quick-reference menu, where you can then choose between the two automatic modes. Intelligent Auto is a standard scene-detecting auto mode, whereas Superior Auto also uses trickery like capturing multiple exposures to increase dynamic range or minimise camera shake and image noise. The quick reference menu accessed by the Fn button also contains typical options like ISO sensitivity, white balance and flash modes, but adds some features more often associated with DSLRs and mirrorless system cameras. You can chose between matrix, centre-weighted and spot metering options, or also dial in some flash exposure compensation. Focus area is adjustable, too, as is the amount of DRO (Dynamic Range Optimizer) that’s applied to high-contrast shots. The camera’s auto HDR feature is also customisable, with up to a 6EV exposure variation possible. Finally, there are various drive modes on offer, including a self-timer with two, five and ten-second delay options, plus the continuous shooting mode, as well as extensive bracketing options. You can choose from manual and continuous exposure bracketing with multiple exposure variation options, plus white balance and DRO bracketing. In playback mode, the Fn button can be used to activate the camera’s Wi-Fi connectivity, letting you send a single image or multiple shots to a smartphone or tablet. NFC pairing makes establishing a connection as simple as just tapping your smart device against the camera, and once connected, a full resolution image will take roughly ten seconds to transfer via Sony’s PlayMemories Mobile app, available for Android, iOS and Windows Mobile. There’s also the option to take control of the RX10 II with your smartphone or tablet, with options to remotely control the shutter release, zoom and self-timer. You’ll also find a pair of control wheels on the rear panel, giving quick and easy settings adjustment. The upper control wheel adjusts functions like shutter speed when in the appropriate mode, whilst the lower wheel by default switches between the various Picture Effect filters. It also doubles as a conventional 4-way D-pad, and though only the top option for changing display formats is marked, pressing the D-pad left is the default control to display ISO sensitivity options. But the main points of interest on the rear panel are the monitor and EVF. The latter is a new 2.35-million-dot device which is a marked upgrade over the original RX10’s already-impressive 1.4-million-dot EVF and is a pleasure to use thanks to its accurate colour and contrast. There’s automatic eye detection to switch between the EVF and the 3-inch LCD monitor. The latter boasts a 1.23-million-dot resolution, which strangely is down on the 1.44-million-dot spec of the original RX10’s screen, but nevertheless provides excellent viewing angles with faithful colour and high contrast. Brightness is also superb, with five stages of manual adjustment, an auto mode, and a Sunny Weather setting which cranks the brightness to the max. The screen is also tiltable and able to be hinged 107 degrees up and 42 degrees down to help with low and high-angle composition, though it can’t be flipped to face forward for selfie shooting. If you do face the front of the RX10 II, you’ll find it’s got a focus mode lever, much like you’d see on a well-specced DSLR. 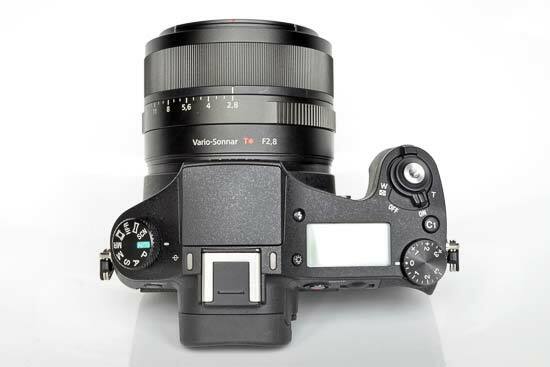 This enables instant switching between single and continuous autofocussing, autofocus with manual override (the lens barrel zoom ring becomes a focus ring) and full manual focussing. This type of electronically-actuated manual focussing can feel clunky on some cameras, but Sony’s implementation is slick and useful. Autofocussing is also impressive. 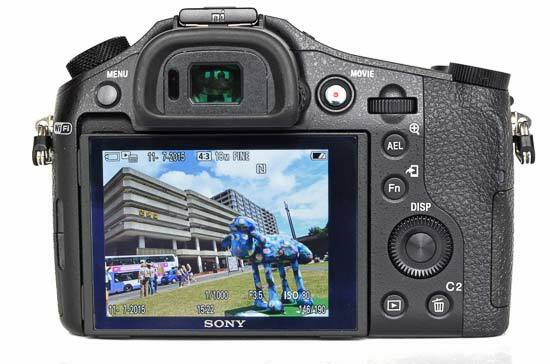 Sony quotes a 0.09-second lock-on speed, which we found to be fairly accurate under bright light, and whilst dimmer conditions do slow things down, the RX10 II still focusses quickly and consistently and avoids focus hunting. Last but not least is battery life, which is up from the original RX10’s 340-shot/170-minute rating to 400 shots/200 minutes, despite both cameras using the same NP-FW50 rechargeable Li-ion power pack. That’s enough to beat the Panasonic FZ1000 and Canon G3 X’s ratings of 360 and 300 respective shots-per-charge ratings. One small gripe is that you don’t get a proper docking-style battery charger with the RX10 II, as Sony instead bundles it with an AC adaptor block and USB cable, so you can’t use the camera whilst a second battery is on charge.